Feed your head with this unique Dead-themed guitar. 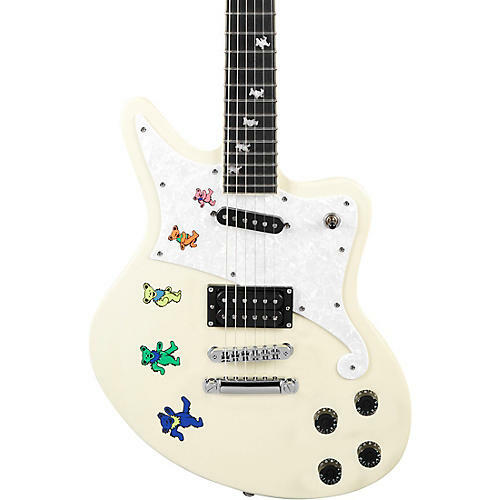 Designed, along the the rest of D'Angelico's Premier Series, to focus on playability, tone and signature aesthetics, the Special Edition Grateful Dead Bedford is not just a sleek, lightweight solid offset-body guitar with tone that is versatile and organic, but way to proudly carry your Deadhead colors, with the signature "Dancing Bears" graphic. Featuring Duncan-Designed pickups, the combination of a stacked single-coil in the neck and a humbucker in the bridge position, along with push/pull coil-tap access, enables you to explore a wide range of tone with a unique look. Get your jam on — order your special-edition Grateful Dead Bedford now. Tuning machines: Grover Rotomatic "Starstep"